It’s the most wonderful time of the year to experience Elgin Symphony Orchestra. Get a glimpse of what’s on the lineup for the holiday season. 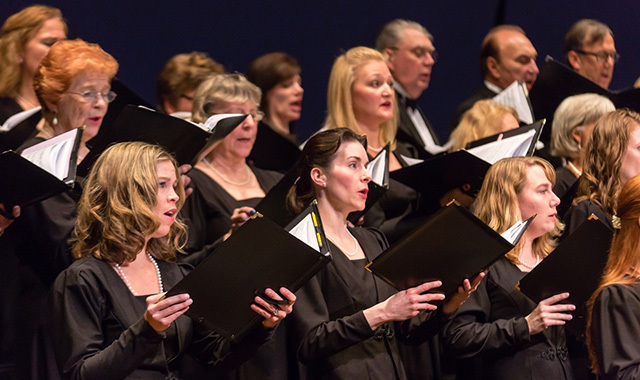 Elgin Master Chorale plans to join ESO for its annual “Sounds of the Season” concert Dec. 8 and 9. The holidays have a familiar soundtrack, one that most people know and love. So when the Elgin Symphony Orchestra (ESO) prepares for its annual “Sounds of the Season” concert, it highlights traditional audience favorites. But that doesn’t mean this year’s event will be the same old song and dance. It’s that kind of tweak that keeps fans coming back every year for what has been one of the ESO’s most popular annual concerts. This year’s event features three shows: two on Dec. 8 (2:30 and 7:30 p.m.) and one on Dec. 9 (2:30 p.m.). They all take place at the Hemmens Cultural Center, along the Fox River in downtown Elgin. Also set to appear with the ESO this year are the Elgin Master Chorale and Midwest Dance Collective. And keeping in line with the theme of tradition, ESO Resident Conductor Stephen Squires will again serve as conductor. And every year, he hands the holiday baton to Squires. “He has vast knowledge of Christmas songs, so when it comes to that show, I ask Steve what he wants to do,” Grams says. The result is one of ESO’s most popular concerts year in and year out, drawing all ages of music lovers, from grandparents to grandchildren, an age group that isn’t often associated with symphony orchestras, but one that is vital to the sustainability of classical music. That sound has entertained the Elgin area for 68 years, and Grams has led the way since joining the ESO in 2013. As an acclaimed guest conductor, he has appeared with many great orchestras including the Cleveland Orchestra, the Philadelphia Orchestra, the Chicago Symphony, the St. Louis Symphony, the Detroit Symphony, the National Symphony Orchestra of Washington D.C., the Montreal Symphony, the Orchestra of the Beethovenhalle Bonn, the BBC Symphony Orchestra London, the Melbourne Symphony and the Netherlands Radio Philharmonic. At the ESO, Grams oversees a group that is made up mostly of musicians from Elgin and the greater Chicago area, however, some come from as far away as Madison, Wis. And the solo talent brought in for various concerts is both national and international. Grams uses a baseball analogy to describe his role. “I’m more or less the manager,” he says. “I work with the players, observe them and help them do better as a team. Over the course of every season that I’ve been at the helm at Elgin, the level of talent has gone up and up. Grams believes that’s a big factor in ESO’s success. After the “Sounds of the Season” performances, the winter months bring an eclectic array of ESO performances, starting with Haydn’s “Surprise” Symphony Jan. 11-13, featuring Squires as conductor and ESO concertmaster Isabella Lippi, who will perform Max Bruch’s Violin Concerto No. 1. Then, on Jan. 26-27, ESO presents “A Night in Old Vienna,” a program of waltzes and polkas reminiscent of Vienna’s famous New Year’s concert. “That’s the kind of light, fun, not-serious music I love to do,” Grams says. And on Feb. 9-10, pianist Natasha Paremski joins Grams and the ESO for “Natasha and the Romantics.” The program highlights the music of Romantic Era composers like Brahms and Chopin. Tickets for the “Sounds of the Season” shows are $35, $45 and $55. Tickets for Haydn’s “Surprise” Symphony, “A Night in Old Vienna” and “Natasha and the Romantics” are $30, $55 and $75 with youth price at $11. And discount pricing is available to all shows for groups of 10 or more. Performances are held at either the Hemmens in Elgin or Prairie Center for the Arts in Schaumburg. “For us, it’s all about the music,” Grams says. “If you come to any of our concerts, there will be at least one thing that you will absolutely love. And it’s always different for every person. For information on upcoming performances or to purchase tickets visit ElginSymphony.org or call (847) 888-4000. This entry was posted on Wednesday, November 21st, 2018 at 11:59 am	and is filed under Arts & Entertainment. You can follow any responses to this entry through the RSS 2.0 feed. Both comments and pings are currently closed.